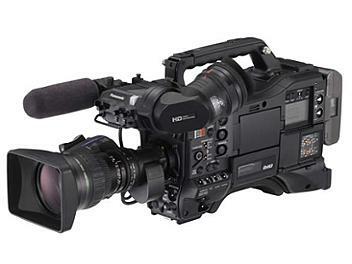 The Panasonic AJ-HPX3100 offers high-end performance in a compact, lightweight design. This 2/3-type P2 HD Camera Recorder ushers in a new level of mobility to nature, dramatic, documentary and ENG production. - Advanced 14-bit Digital Signal Processing (DSP) circuit with A/D conversion and 12-axis independent color compensation and detail. - Supports optional camera studio system (camera adaptor, base station, VF adaptor and extension control unit). DC OUT: 4 pin, DC 12 V (DC 11 V-17 V), max 1.5 A.